Automotive Service Solutions uses high-tech equipment such as Mitchell On-Demand, internet and All Data to help repair vehicles. Mitchell is the most powerful, fastest growing electronic automotive repair database on the market. It is basically a "map" to the repair answers the tech might need as they work on a vehicle. With Mitchell On-Demand, All Data and internet our techs have access to over one million pages of technical data to help guide through repairs. Included in the databases are over 500,000 pictures and graphics. Also included in Mitchell On-Demand and All Data are technical service bulletins, EPA recalls and National Highway Traffic Administration recalls. By using Mitchell On-Demand, the internet and All Data our techs are not likely to come to a "dead end" when diagnosing your vehicle. Our techs save valuable time by not having to thumb through countless books and magazines. 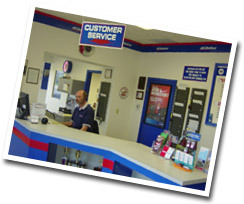 Your vehicle is fixed efficiently due to a quick, concise diagnosis by our knowledgeable technicians. Provide clear communication about the cost and type of repairs needed for your vehicle. Suggest a preventative maintenance program to keep your vehicle running well. Answer questions about the repairs and operation of a vehicle so you have a clear understanding. Provide ASE Certified Technicians at a Blue Seal of Excellence Facility. To cooperate with your busy schedule as best as we can. To provide the highest quality of workmanship and parts available. To provide a parts warranty of 12 months/12000 miles unless noted differently by a specific manufacturer. To provide a labor guarantee of 12 months/12000 miles. We accept Discover, Mastercard, Visa, American Express, cash and personal checks as forms of payment. Realize that waiting for a car repair is usually not feasible. Provide access to one decision maker that we communicate with. Dealing with more than one person slows the repair of the vehicle and causes confusion. Appreciate our reputation as a quality repair facility and understand that we may decline to do "patch repairs". Have a cooperative attitude and try to communicate problems and expectations clearly. Respect our goal of building a long term trusting relationship with customers and trust that we make decisions based on their best interests. Recognize that we are human and do err but will do everything possible to correct the situation in a timely and fair manner.